Crews are scheduled to begin work again Monday in a Point Loma neighborhood flooded by a water main break. For the second day, nearby residents were without water after a pipe burst Sunday around 1 a.m. in the 2700 block of Nimitz Boulevard. The break caused extensive flooding and damage to different apartments in the area. City of San Diego Public Utilities Department spokesperson Arian Collins called the rupture of the 16-inch cast iron water main one of the department’s largest in recent memory. Water department officials said the main break was first reported around 1 a.m. in the 2700 block of Nimitz Boulevard. NBC 7's Chris Chan reports. 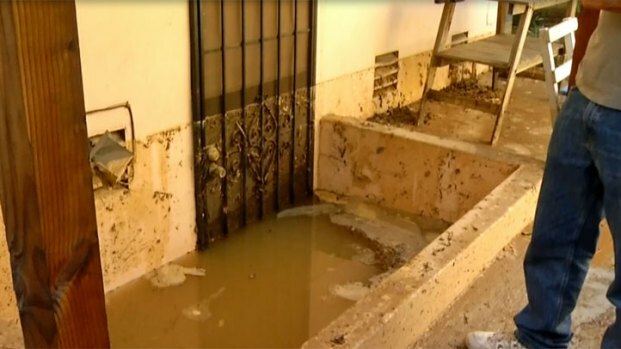 Some residents told NBC 7 San Diego their apartment units were flooded, with the water causing damage to their homes and belongings. Kimberly Callahan said the flood water destroyed her computer, sentimental personal items and brand new furniture. "I just had a brand new beautiful kitchen dining room set, with a bench and four chairs and a big top," she said. "The top is peeled back from water damage." Property owner Curtis Klapp said the basement of one of his rental units was flooded with about seven feet of water. “This is a bad situation," said Klapp. "It's a mess." Residents had trouble finding free hotels. Klapp said he went to 10 different locations. Some residents told NBC 7 San Diego they had to travel to Mission Valley to find a place to stay and a hot shower. Collins said the City would be working and assisting residents whose homes were damaged by flooding as a result of the main break. The cause of the main break is still under investigation, but Collins believes it could be attributed to corrosion. City workers initially said water service would likely be restored to homes by 6 p.m. Sunday, but problems with equipment used to cut the broken main prevented service from being restored by nightfall. Nimitz Boulevard was temporarily closed down as crews worked to repair the main break and clean up the mud and debris.